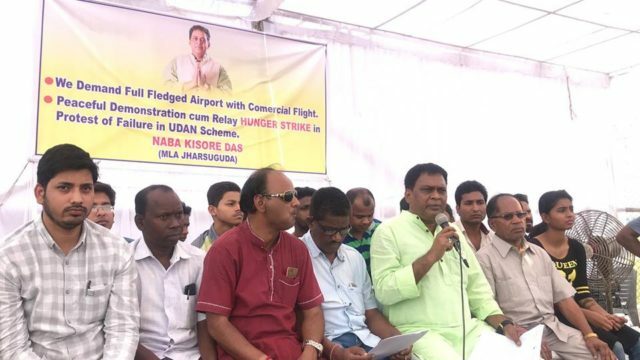 Jharsuguda: Local Congress MLA Naba Kumar Das, along with his supporters, on Tuesday sat on a dharna in front of the Veer Surendra Sai Airport here demanding regular flights to the airport, which was inaugurated a month ago by Prime Minister Modi. Das said the airport has no regular schedule for operation of flights. Besides, there have been no commercial flight operations since the inauguration of the airport. “We had extended our support during the inauguration of the airport by Prime Minister Narendra Modi cutting across party lines thinking that at least some developmental work was going to happen in the district. However, the people of Jharsuguda and the State have been cheated,” he alleged. He further said that on behalf of the people, the dharna would be continued for two days. “Later, we would meet the Prime Minister and remind him about his promise about bearing the expenses of commercial flight operations from the airport. We will also approach the Civil Aviation Ministry with our demands,” Das added.